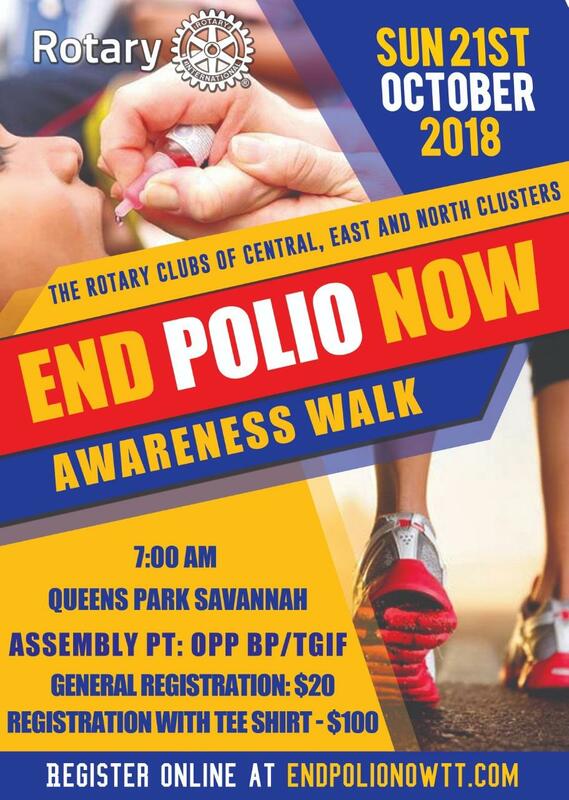 The Rotary Clubs of the Central, East and North Clusters will be having a Polio Awareness Walk on Sunday 21st October from 7:00 am at the Queen's Park Savannah (Starting Point: Opposite BP/TGIF). Registration is either TT$20.00 per person (Registration Only) or TT$100.00 which includes Registration and a TShirt (Colours available: red, white, yellow or blue). Offline Registration: Paper Based Bookshop, The Market at The Normandie, 10 Nook Avenue, St Ann's, Port of Spain. 625-3197/ 235-3762/ 734-6091.